The programme consisted of 9 sections, each act accompanied with the impressive, live, Mariachi-type musicians, replete with sombreros. Los Matachines – a dance from Northern Mexico, performed during religious festivals, since the Sixteenth century, and originating from Spain along with their conquest. Guerrero-Guerrero – Referencing Vincente Guerrero, a Mexican independence hero, and important military and political figure. As an adjective ‘guerrero’ means courage. The tri-partite dance consisted of Solo de Mariquita, Las Amarillas and El Gusto. 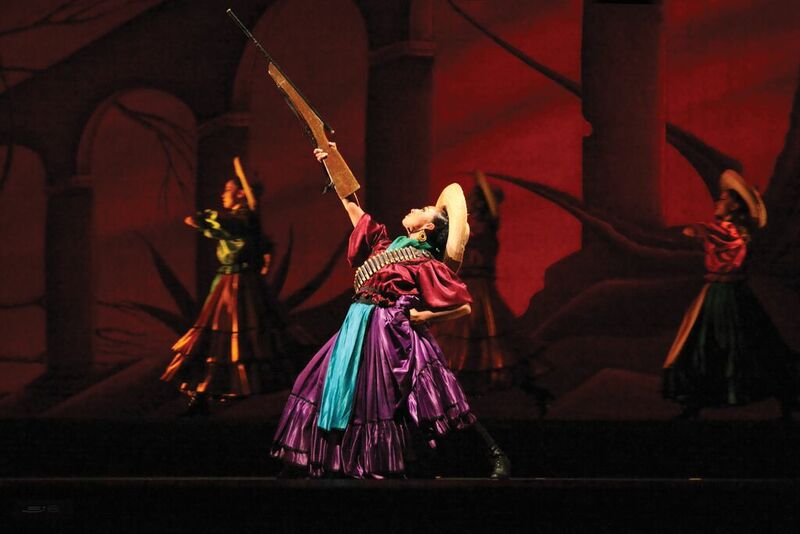 Revolucion – This act was dedicated to the Soldaderas, the women who joined in the military and political campaigns of Modern Mexico, beginning with the revolution in 1910. Charreada – A Mexican tradition, charreria is a series of sports competitions demonstrating bravery and originating from skills acquired from working on the land of the old haciendas of Mexico. Fiesta in Tlacotalpan – A February 2nd festival dedicated to the Candelaria virgin with the appearance of huge mojigangas. Dance of the Quetzales – A symbol of elegance and beauty, the quetzal is a mythical Central American bird. 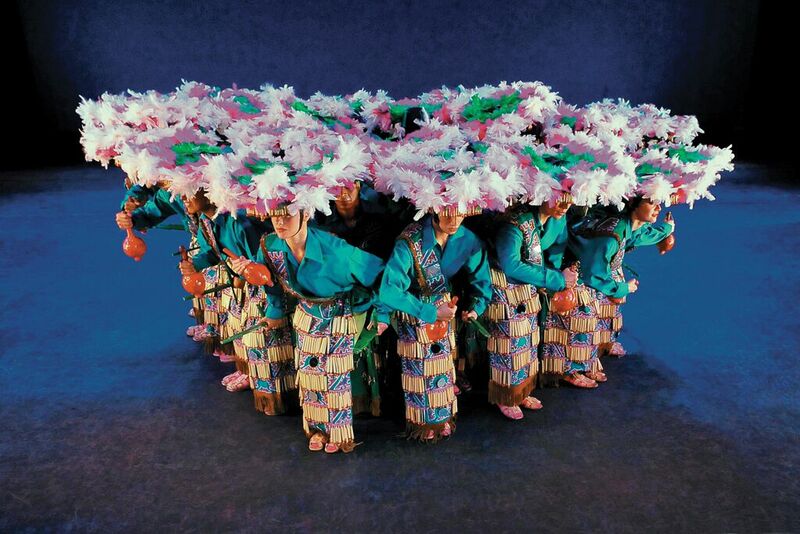 The dance is typically performed in the state of Puebla. 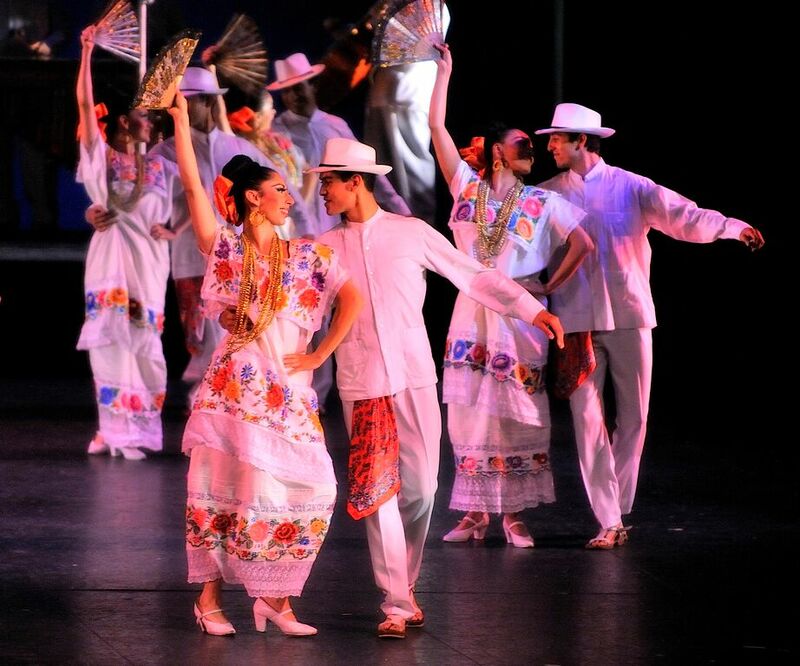 Danzon and Jarana – A fusion of European, African and Caribbean dances performed in the pre-conquest Mexico and combined with a contemporary Spanish influence. Dance of the Deer – A symbolic performance of a deer of hunt of the Yaqui people, it constitutes one of the best examples of imitative magic. Fiesta in Jalisco – A couple of dances, the china and the charro from the state of Jalisco, the fiesta explores the careful wooing and captivation of the ladies. A whirlwind of exotic exuberance; chaotic and at times garish, but vibrant colours; a flurry of pettitcoats amidst exquisite techinical virtuosity; a veritable tour de force of passion: from start to end the entire performance(s) was utterly mesmerising and totally magical. Audience and dancers alike were serenaded by the mariachi bandito-esque band on stage, and treated to soulful renditions of Mexican folkloric music, including an upbeat peformance of ‘La Bamba’. The most remarkable aspect of the show was the pure passion and zest that went into it. Such was the wild, riotous fun that it became contagious and oftentimes incited the audience to join in! Special mention goes to the cavaliero-type cowboy, with his impressive and skillful handling of the noose from the Fiesta in Jalisco act; the Revolucion act, with the bold and beautiful women soldiers, and the ‘Dance of the Deer’ – a powerfully visceral performance. The oscillation between the bold and the sensually soft throughout, showed to full effect the skill of both the dancers and the spectacular choreography. With the torro-esque – and actual torro – scenes unfolding love stories before your eyes, coupled with the paroxysmal energy and dynamic movements, the show was an artistic explosion of life. All images thanks to ©Ballet Folkloricko De Mexico De Amalia Hernandez.